The Washington County Museum presents a panel discussion with local experts who will help explore the complex topic of growth. Part of a discussion series held at locations around the county, the theme was chosen because it reaches into the lives of everyone in the area. 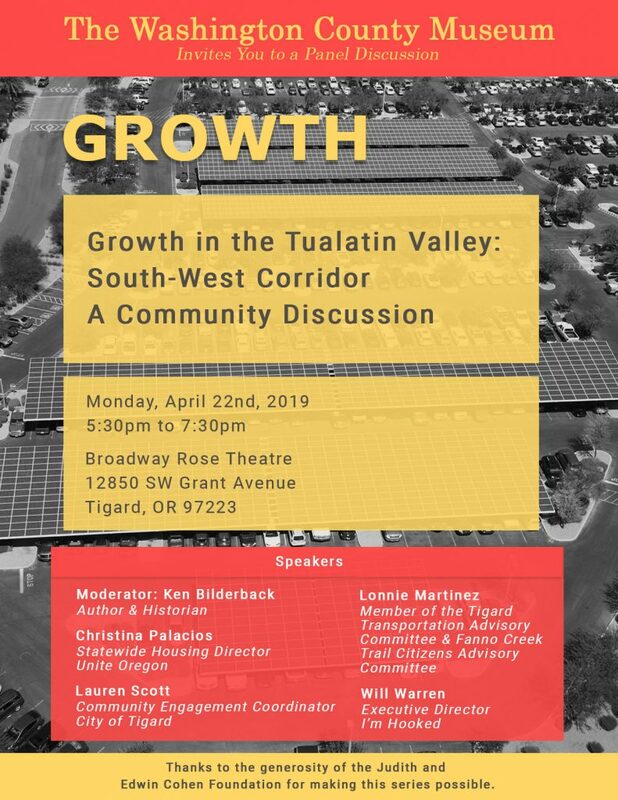 This event will look at the aspects of growth that are most relevant to the South-West Corridor such as the MAX line expansion, housing and houselessness, access to nature and transportation. As stewards of Washington County legacy and culture, the Washington County Museum convenes this discussion so regular folks can listen to and join community conversations in an environment that invites participation and interdisciplinary thought, as well as learn historical contexts for present issues. Many community talks are organized and staffed by political entities – and those are an essential part of civic engagement – but with an historian in the role of mediator and voices in the panel bringing diverse professional and personal backgrounds this conversation can be an open and nuanced exploration. Washington County Museum hopes this event can help the community make sense of some of the historic changes playing out over the recent past, present and near future. Join them for this important community conversation! The Washington County Museum is open Wednesday through Saturday from 10am to 3pm and is located on the Portland Community College Rock Creek Campus, 17677 NW Springville Rd, Portland, Oregon.